WASHINGTON, DC | NEW YORK, NY, August 28, 2018 – Tata Consultancy Services, (TCS), (BSE: 532540, NSE: TCS) a leading global IT services, consulting and business solutions organization, and Discovery Education, the leading provider of digital education content and professional development for K-12 classrooms has announced the launch of the TCS Discovery Education Ignite Innovation Student Challenge. The brand-new competition gives young innovators an amazing chance to win $10,000 and receive virtual mentorship from a team of TCS technology experts to bring their winning idea to life. 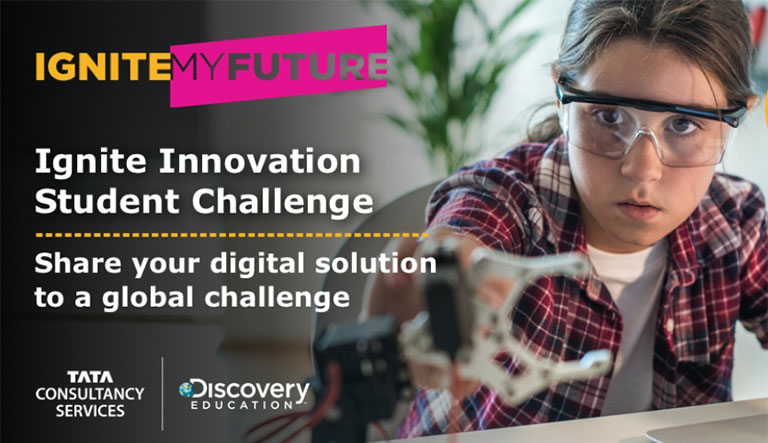 The Ignite Innovation Student Challenge encourages sixth through eighth-grade students to use computational thinking to create digital solutions that improve the world and solve problems impacting TCS’ social responsibility pillars of Our Planet, Health and Education. All video and written description entries must be submitted online at www.ignitemyfutureinschool.org/Challenge no later than December 13, 2018. Launched in 2017, Ignite My Future in School is an initiative that combines the best of digital content, lesson plans, career vignettes, and professional learning to help teachers prepare their students for careers of the future. The initiative offers educators instructional resources and year-round curriculum support to ensure that computational thinking is embedded into core subjects such as math, sciences, arts and social studies. This interdisciplinary approach helps students to obtain the necessary skills required for 21st century careers across all industries. For more information on the TCS Discovery Education Ignite Innovation Student Challenge, including idea starters, project flow, four-week road map, planning guide, templates, and complete rules, please visit www.IgniteMyFutureInSchool.org/Challenge.Stay connected with Discovery Education on Facebook, Twitter and Instagram @DiscoveryEd. Tata Consultancy Services is an IT services, consulting and business solutions organization that has been partnering with many of the world’s largest businesses in their transformation journeys for the last fifty years. TCS offers a consulting-led, cognitive powered, integrated portfolio of IT, Business & Technology Services, and engineering. This is delivered through its unique Location Independent Agile delivery model, recognized as a benchmark of excellence in software development. A part of the Tata group, India’s largest multinational business group, TCS has more than 400,000 of the world’s best-trained consultants in 46 countries. The company generated consolidated revenues of US $19.09 billion for year ended March 31, 2018 and is listed on the BSE (formerly Bombay Stock Exchange) and the NSE (National Stock Exchange) in India. TCS’ proactive stance on climate change and award-winning work with communities across the world have earned it a place in leading sustainability indices such as the Dow Jones Sustainability Index (DJSI), MSCI Global Sustainability Index and the FTSE4Good Emerging Index. For more information, visit us at tcs.com.